I love being able to help my patients achieve a better quality of life by applying the latest and up to date surgical techniques. 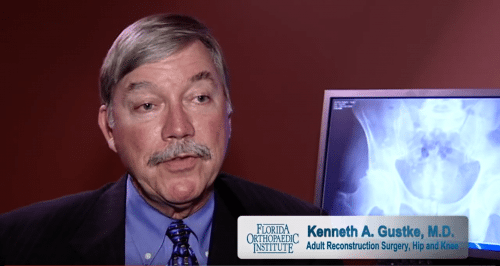 Dr. Gustke is a founding member and past President of Florida Orthopaedic Institute. He received his medical education at Wayne State University and completed his orthopedic residency at Henry Ford Hospital, both in Detroit. Dr. Gustke received additional training in joint replacement and arthritis surgery at New England Baptist Hospital in Boston, and completed a fellowship in joint replacement and adult orthopedic reconstruction at the Mayo Clinic in Rochester, Minnesota. Dr. Gustke is renowned on the national and international level for his pioneering efforts in joint replacement surgery implant design and surgical technique. He is the co-designer of eight total hip replacement implants and a complete total knee replacement system which includes four different types of total knee implants. His implants have been implanted by other surgeons in hundreds of thousands of patients worldwide. He also holds three patents on hip replacement design. Dr. Gustke has been a primary developer of muscle sparing minimally invasive knee and hip replacement surgical techniques. As a consultant to a computer navigation company, he assists in the development of computer-assisted surgical techniques and instrumentation. He has published numerous articles, textbook chapters, and technical monographs and has edited two professional journals. He has presented lectures at more than 400 local, national, and international forums. Twice yearly, he travels to Europe to perform and instruct orthopedic surgeons on the art of total knee replacement surgery. He monthly has national and international orthopedic surgeons visit him in Tampa for two to four day observerships. Dr. Gustke has practiced medicine in Tampa for the past twenty-eight years. He is board certified by the American Board of Orthopaedic Surgery and a founding member of the American Association of Hip and Knee Surgeons. He is a Member of The Knee Society, a closed group of 109 members representing the very best knee replacement surgeons in the world. Dr. Gustke is the best. He and his staff answer all of your questions. They care about your concerns. They check everything. He is the best doctor I have ever been to. Selecting Dr. Gustke and his carefully selected team was, without reservation, the most appropriate decision for my circumstances. My local physician, with whom I hold in great regard recommended Dr. Gustke. You know you are with the best when the demand far exceeds availability, the administration is carried out efficiently and the staff are the very, very best. Dr. Gustke, my thanks are certainly not enough for the gift you have given to me. I cannot express how grateful I am that we have men and women of such quality and dedication leading the orthopedic profession of our society in this country and are still continuing to grow, to learn, to contribute and share your skills with others in your profession. Thank you! After 25 years of care by Dr. Gustke & Staff, I am totally satisfied and grateful for their expertise and problem solving ability! After seeing two great orthopaedists in Atlanta, I decided to try Dr. Gustke with his robotic arm assisted knee replacement. I’m beyond thrilled. Everything was so smooth from first appointment to all the help from Monica, education seminar, superior surgery and scar, recovery and inpatient at Tampa General, home PT with Kendra, post-op care from Dr. Gustke’s office, and PT at FOI Palm Harbor with Steve, Alphonso, and Megan. It’s been so professional. All my doctors and PT friends are so impressed with my scar and quick recovery. When I have my second knee done next year when this snowbird returns, it will be with Dr. Gustke and FOI. They are 5 stars in every aspect of patient care from a phone call to front desk through better outcomes than expected! Thank you! I have been going to FOI for 4 years now. I have had both of my hips replaced by Dr. Gustke. He is a “best of the best” Ortho Doctor. In fact, all of his staff and interns are! Dr. Gustke did hip replacement surgery with bone grafting Nov. 13,1990. Yes, almost 25 years and still in great shape. I no longer live in Florida but the surgeon here is amazed by my terrific result. Words truly can’t express what a difference surgery made or how grateful I am to have been a patient of Dr. Gustke. Thank you! Dr. Gustke performed two total hip replacements in 2010 for me. I’ve had absolutely no issues since. He may be short on words but tremendous on talent, Thank you again for giving me back my life sir.